– Penny postcard postmarked January 1913; Wm. Jubb, Syracuse; made in Germany. The original Alhambra, built in 1884 as a skating rink at the height of the roller-skating craze, burned on 20 December 1899. 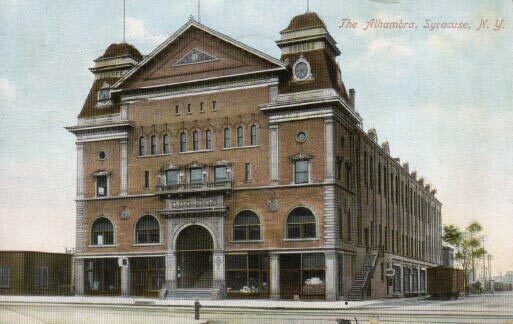 This version of the “new” Alhambra, built at 267-279 James Street, was completed in 1900 as Syracuse’s answer to New York City’s Madison Square Garden. 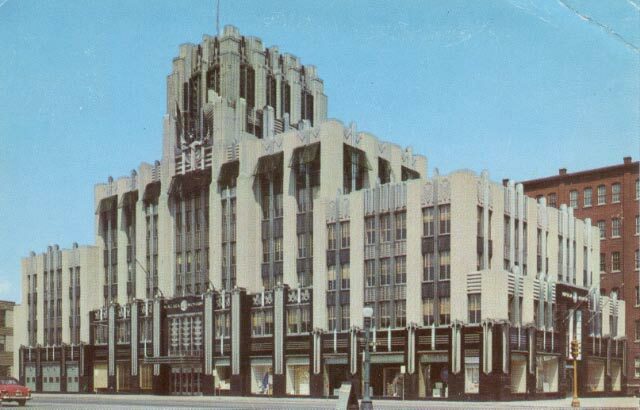 It was the place for political conventions, concerts and music festivals, grand social events, and boxing matches (when the Alhambra was known as “the James Street hall of swat”). “Kid Dyke” (Tony Rexin), Freddie Sallus, Tiger Perry, Benny Odell, and many other local boys fought there in the heyday of “bootleg” amateur boxing (late 1920s-early 1930s). This building also suffered a fire on 13 November 1947, and then fell into decay. 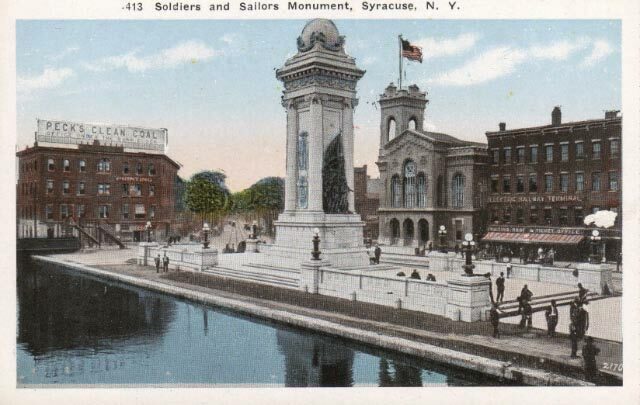 – Image from penny postcard postmarked October 1906, Souvenir Post Card Co. Caption: “4451—City Hall, Syracuse, N.Y.” Shows Syracuse’s Romanesque City Hall building (built 1892-1894? of Onondaga limestone) located on East Washington Street with its sign visible from passing trains: “Syracuse Bids You Welcome.” This building is still in use and was placed on the National Register of Historic Places in 1976. – Postcard, Community General Hospital. When my sister was born there in 1964, this hospital was called Community Hospital in the Town of Onondaga, County of Onondaga, and was a relatively new hospital, having opened its birthing center in 1961. 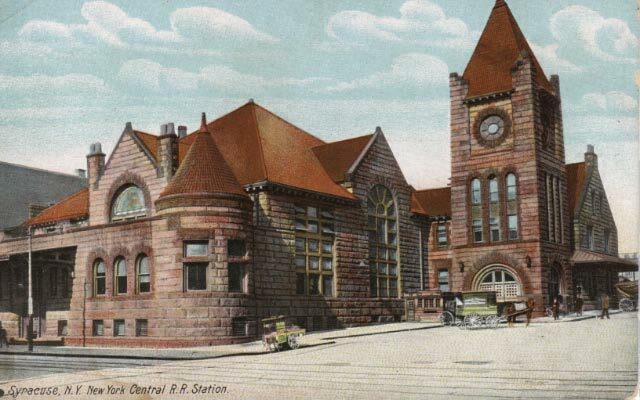 The back of this postcard is postmarked 1973 and the printed caption reads: “Community-General Hospital of Greater Syracuse, Broad Road, Syracuse, New York 13215. Modern 300-bed general hospital; completely air-conditioned with individual room controls; one and two-bed rooms only; each patient has bedside radio, television and telephone; electrically operated beds; nine operating rooms; Medical, Surgical, Maternity, Pediatric and Emergency services.” Today it is known as Community General Hospital of Greater Syracuse, 4900 Broad Road, Syracuse, NY 13215; telephone (315) 452-5011. – Unused “linen” postcard (c. 1934-1945), Wm. 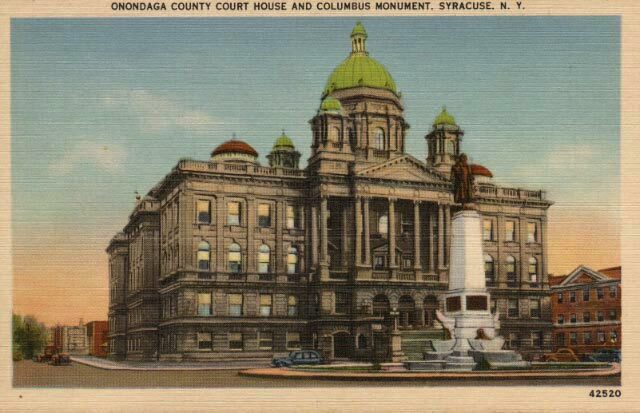 Jubb Co., Syracuse, with caption: “Onondaga County Court House and Columbus Monument, Syracuse, N.Y.” This is a view of the fourth Onondaga County Courthouse, built on St. Mary’s Circle (today known as Columbus Circle after the bronze statue of Christopher Columbus erected there in 1934). This building opened in 1907, replacing the smaller, “old” courthouse on Clinton Square. 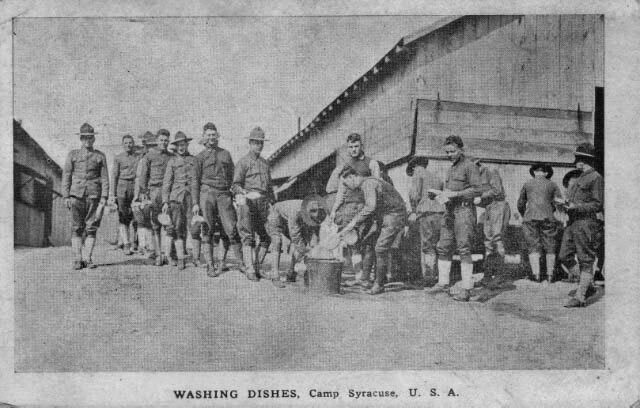 – Image from unused penny postcard (undivided back – c. 1901-1907?) 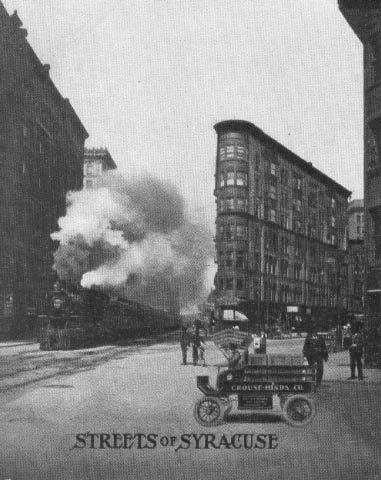 showing a New York Central Railroad train coming eastward along Washington Street (photographed from near the front of City Hall). 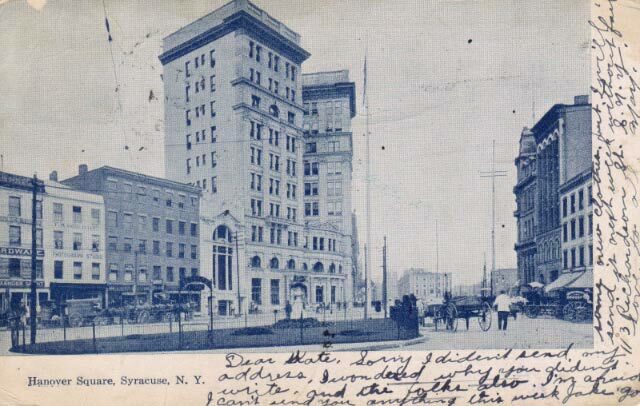 The S&K Building (looks like a “Flatiron” building) can be seen after it grew from four to seven stories in 1894. A loaded Crouse-Hinds’ factory “horseless carriage” awaits the train. 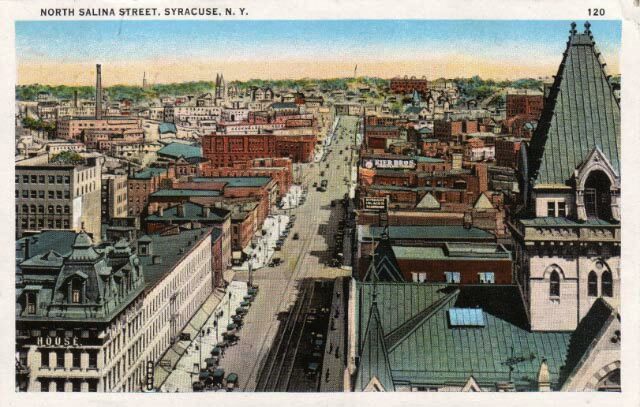 -- Penny postcard postmarked October 1906 showing Hanover Square, Syracuse, N.Y. Hanover Square is really a triangle, and was once the city’s commercial and entertainment center. 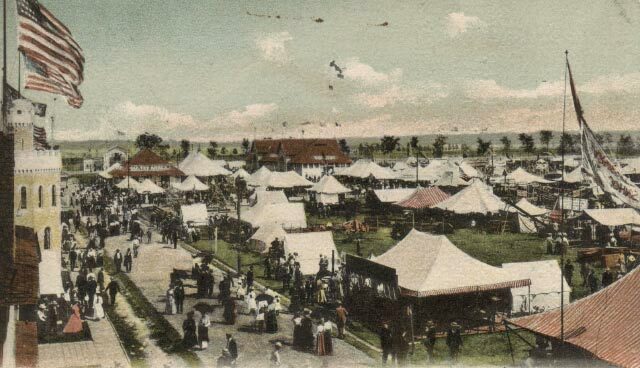 For most of the 1800s this open space was a gathering place where carriages for hire congregated. Civil War soldiers were recruited here, and thousands gathered here to hear the memorial services for Abraham Lincoln when his funeral train stopped here briefly on its way to Springfield, Illinois. – Four-cent postcard postmarked July 1959 of the Niagara Mohawk Power Corporation, General Offices, Syracuse, N. Y. 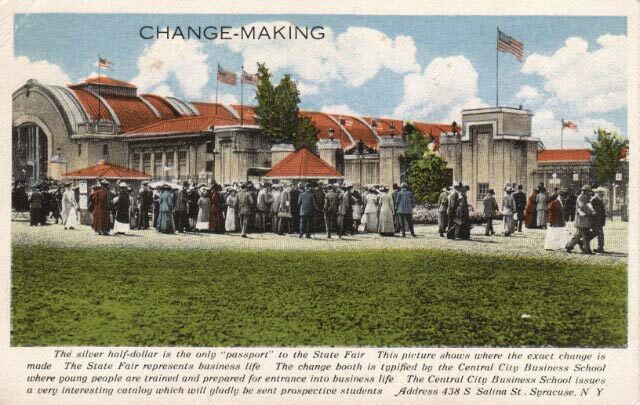 Remainder of the caption on the back of the postcard reads: “These offices are part of a service center occupying approximately 4 acres in the heart of the city. The company serves a large part of upstate New York extending from the Niagara frontier to the New England states and north to the Canadian border. Its tower carries an imposing figure in steel symbolizing Electric Power.” Wm. Jubb Co., Inc., Syracuse. 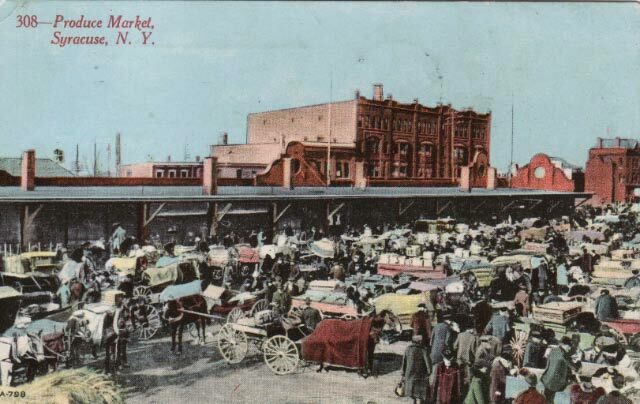 – Penny postcard postmarked November 1916 by Randolph Bros. Manufacturers, Syracuse, showing the “Produce Market, Syracuse, N.Y.” This was the gathering spot known as the farmers’ market on the Northside of Syracuse in the early 20th century. Farmers from around the area would bring their produce and wares here to sell. – Rudolph Bros. postcard (divided back, probably c. 1910), unused, No. 335, captioned “North Salina Street, Syracuse, New York” (from the horse and carriage era). 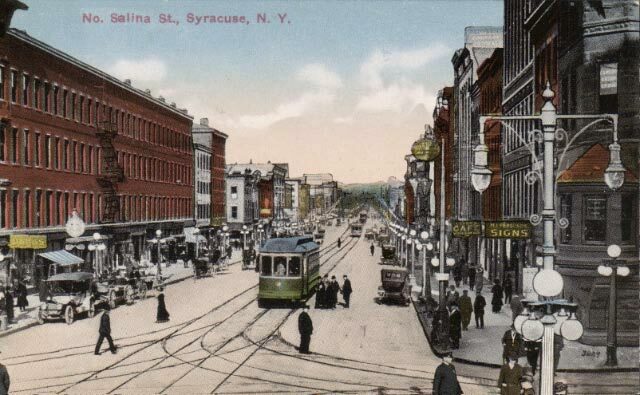 – Rudolph Bros. postcard (divided back, probably c. 1915-1917), unused, captioned “North Salina Street, Syracuse, N. Y.” (from the trolley car and Model T era). – Two-cent postcard postmarked August 1931, no. 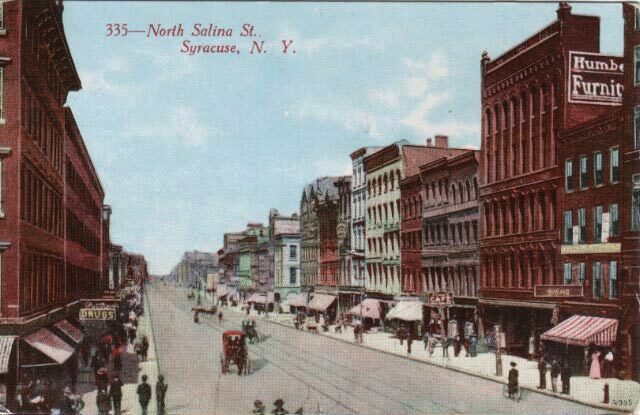 120, published by Miller Paper Co., Syracuse, N.Y. Captioned “North Salina Street, Syracuse, N.Y.” it shows the view looking north up North Salina Street from Clinton Square. 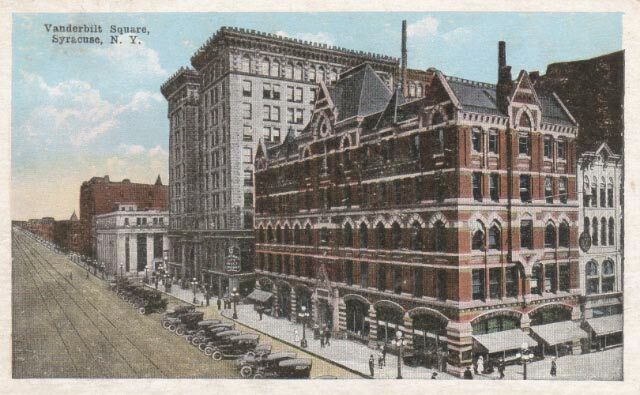 The Empire House can be partially seen at the left; the Syracuse Savings Bank Building is in the foreground, right (with green peaked roof). – Unused penny postcard, undated (divided back circa 1915), The Hugh C. Leighton Co., Manufacturers, Portland, Maine; made in Germany no. 7449; caption reads: “Syracuse, N.Y. New York Central R.R. 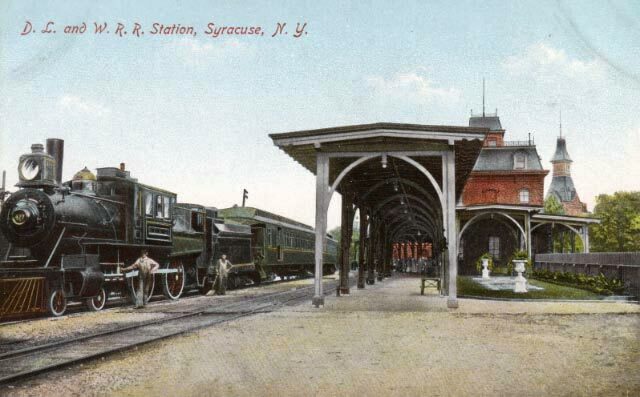 Station” (photo from the horse and wagon era?). 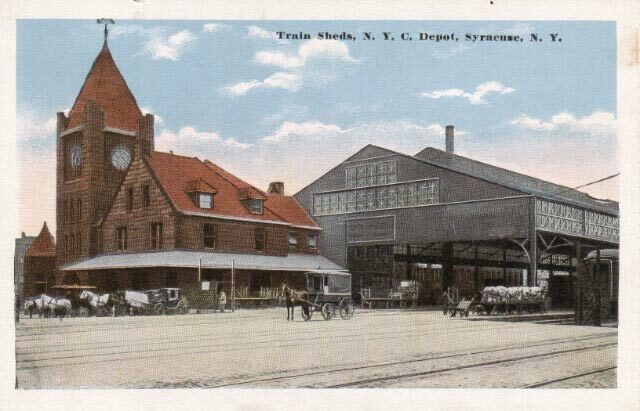 – Unused, undated penny postcard (divided back, front border era, 1916-1930), caption reads: “Train sheds, N. Y. C. Depot, Syracuse, N. Y.” (New York Central Railroad depot photo from horse and buggy era). 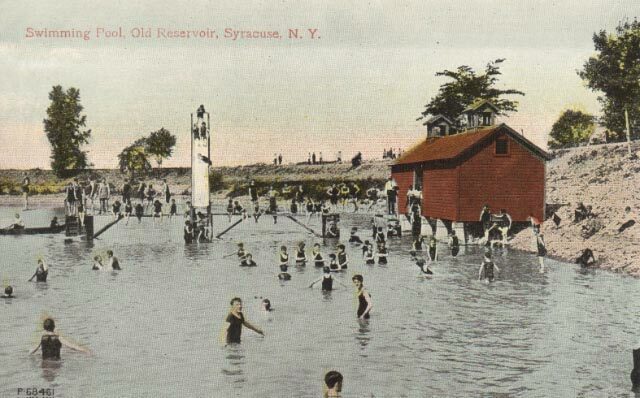 – Unused, undated penny postcard (divided back circa 1915), with caption: “Swimming Pool, Old Reservoir, Syracuse, N. Y.” When the Woodland Reservoir opened on South Geddes Street in 1894, the old Wilkinson Reservoir was no longer needed to supply Syracuse’s drinking needs. In 1898 the 71 acres around the Wilkinson Reservoir was bought by the city to form Onondaga Park. 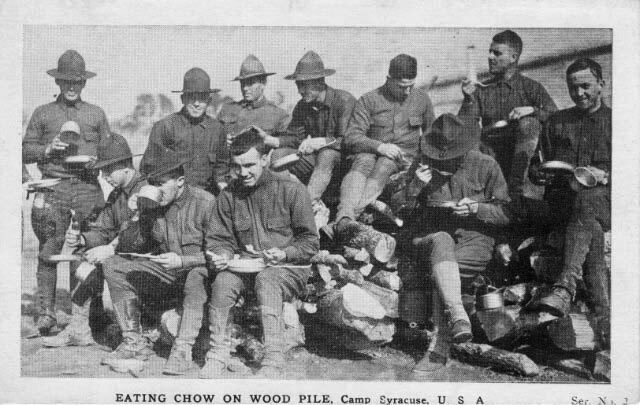 In 1903 more wooded land (the Olmstead Grove) was acquired and became a popular picnic area near the old reservoir that is still in use today. In 1911 Wilkinson Reservoir was renovated and renamed Hiawatha Lake. 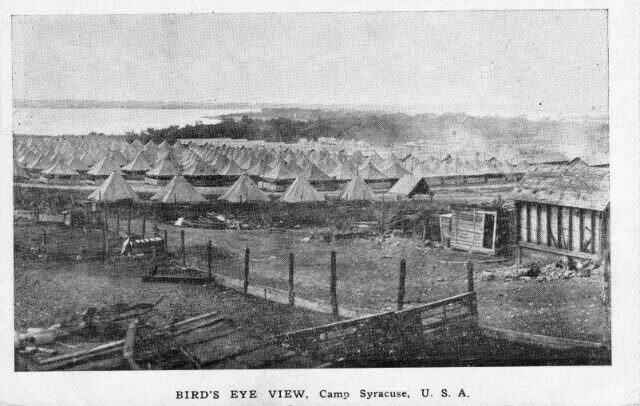 Today it is the central focus of Onondaga Park on the southwest side of Syracuse. – Penny postcard postmarked August 1930 (Colorchrome/Syracuse News Co. no. 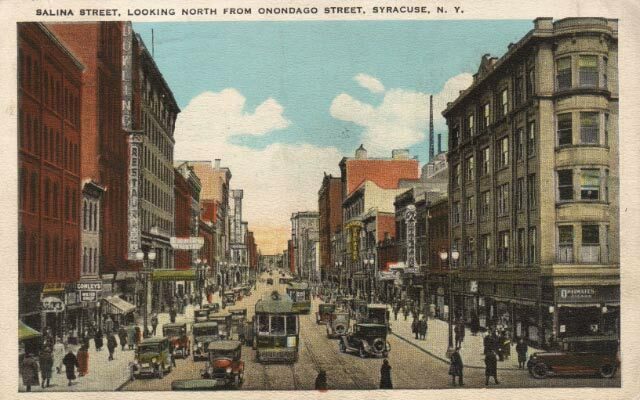 123392), with caption: “Salina Street, looking north from Onondaga Street, Syracuse, N. Y.” Shows Conley’s Men’s Shop, Empire Theater, Optimates Cigars, street cars and Model Ts. – “Linen” postcard (c. 1930-1945) with one-cent stamp, postmarked May 1947 (Wm. Jubb Co., no. 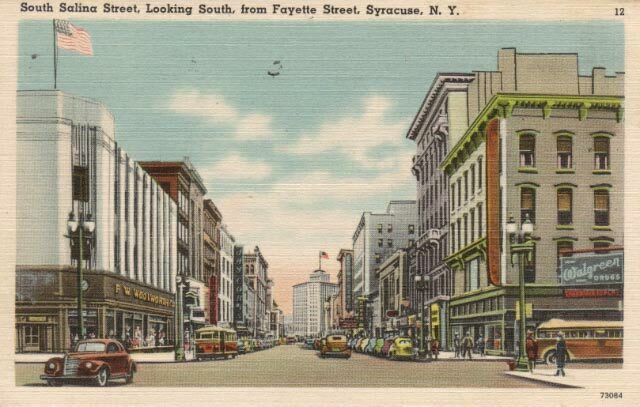 E-6771), with front caption: “South Salina Street looking north, Syracuse, N. Y.” Caption on back of card reads: “This view of Salina Street intersecting Jefferson Street shows the center of the shopping and theatre district.” View shows Loew’s State Theater on the left, Dey Brothers’ store on the right. – “Linen” postcard (c. 1930-1945) with three-cent stamp postmarked January 1960 (Wm. Jubb Co., no. 12; 73084). 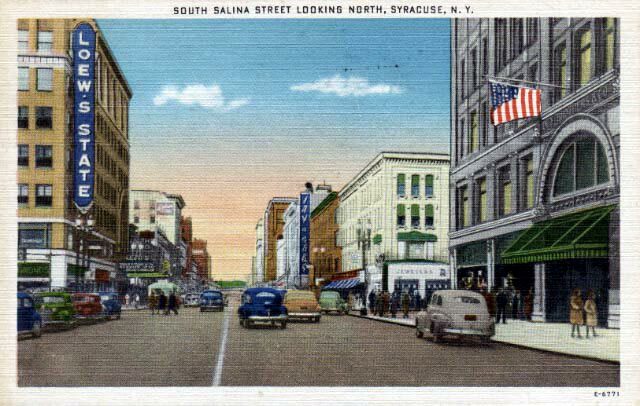 Caption on front of card reads: “South Salina Street, Looking South, from Fayette Street, Syracuse, N. Y.” Caption on the back of the card reads: “South Salina Street – This is one of the busiest and widest intersections in the city. It shows the principal retail shops and the theatre section of the city.” The view shows F. W. Woolworth Co. on the left side; Walgreen’s Drugs on the right side; Loew’s State Theater down the right-hand side of the block, and the Chimes Building at the far end of the street. – Photographic card, undated and unused (circa 1945 or 1950, from the automobiles?) 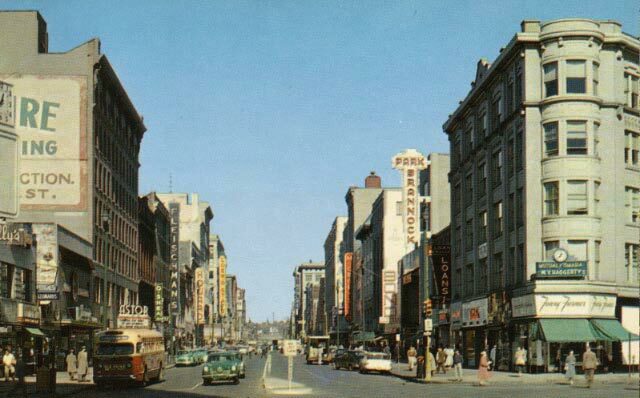 (Carhart Photo Service/ Plastichrome); caption reads: “Salina Street looking north from the Chimes Bldg., Syracuse, N. Y.” View shows the Astor Theater, O’Shea’s, Fleischman’s, Howard, and Loew’s State theater on the left; W.V. Haggerty, Fanny Farmer candy store, Brannock parking on the right. – Image from penny postcard postmarked September 1906, H. L. Woehler, Buffalo, N.Y. & Dresden Germany. 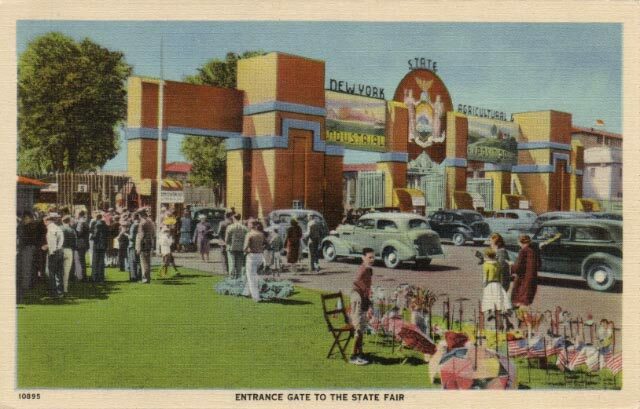 Caption: “712 – State Fair, Syracuse, N.Y.” The New York State Fair is the nation’s oldest, and was first held in Syracuse in 1841. It has been held there annually since 1890. 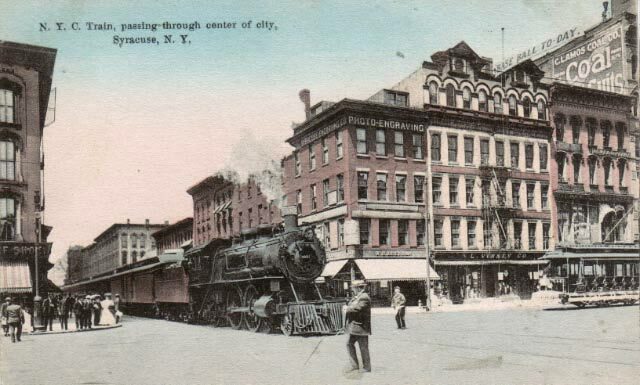 – Penny postcard postmarked September 1910, Published by Ralph Finney, Times Square Station, N. Y. City. 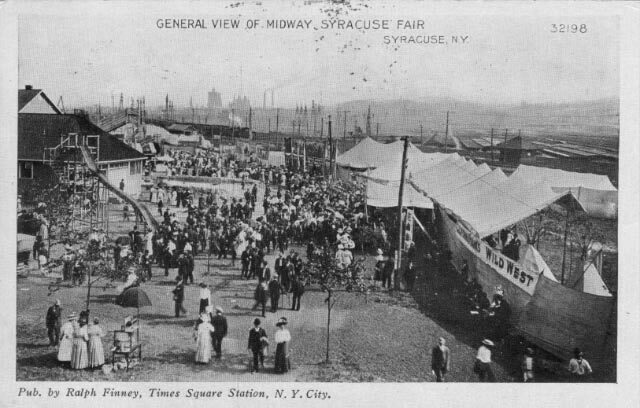 Caption: “General View of Midway, Syracuse Fair, Syracuse, N. Y. (32198)” This view shows Syracuse’s solar salt flats in the distance behind the Wild West show on the right. – Unused, undated “Plastichrome” postcard from before July 1963 (when Postal Zip Codes began to be used); probably from late 1950s (from autos in photo) (“Colourpicture” Publishers / Charter Photo Service, P12667). 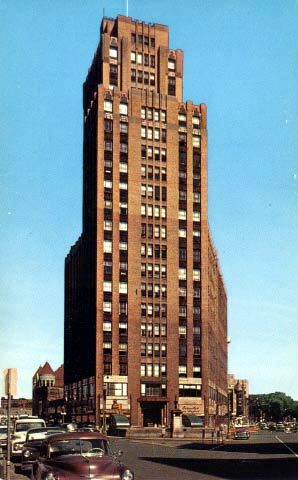 Caption reads: “The State Tower Building, Syracuse, N. Y. Syracuse’s tallest office building and a downtown ‘landmark.’ Many Syracusans can remember visiting their doctors, dentists, lawyers, and insurance brokers in this building. Located at 109 South Warren Street, it was built in historical Hanover Square in 1927-1928 of concrete and steel with a facade of limestone and terracotta. It cost $1,500,000 to erect, and at 21 floors, it is still Syracuse’s tallest office building. 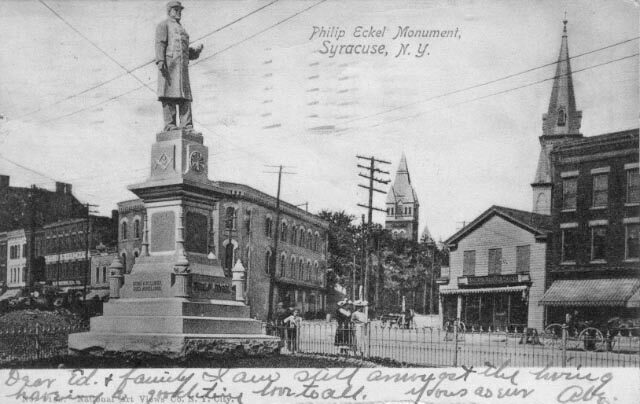 – Penny postcard postmarked March 1908, published by Raphael Tuck & Sons; Series No. 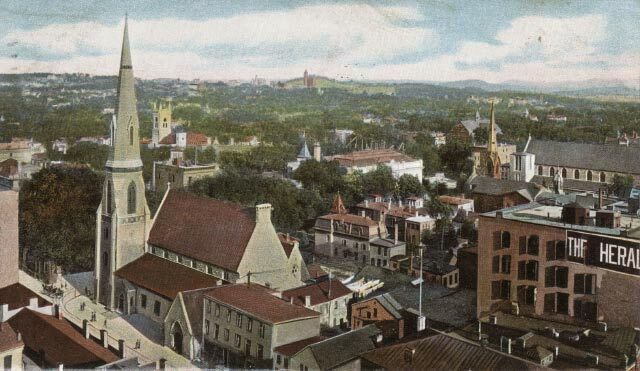 2025, “Syracuse, N. Y.” Caption: “Syracuse, N. Y. Bird’s-Eye View.” The church pictured on the left, built in 1884, was then known as St. Paul’s Church (and is today called St. Paul’s Episcopal Cathedral, and is still located at 310 Montgomery Street at the corner of East Fayette Street). The home of the Syracuse Herald newspaper can be seen at left. – Unused, undated penny postcard (divided back c. 1911-1917), no. 456/5394 published by Rudolph Bros. Art Publishers, Syracuse. 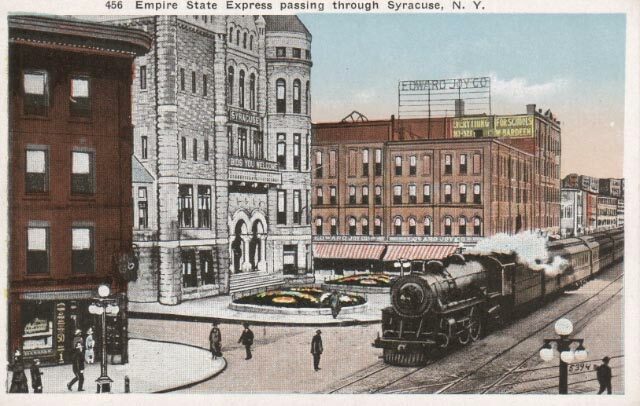 Caption on the front of the card reads: “Empire State Express passing through Syracuse, N. Y.” The famous Empire State Express of the New York Central Railroad is passing west on Washington Street past Syracuse’s City Hall, with its sign: “Syracuse Bids You Welcome.” The S&K Building on the far left is only four stories high in this view (before the other three stories were added in 1894?). On the right is seen the Edward Joy Company. – Unused, undated postcard (no. 12777, no publisher data, divided back/front border era, 1916-1930, probably c. 1920s, dating from autos in the photo). 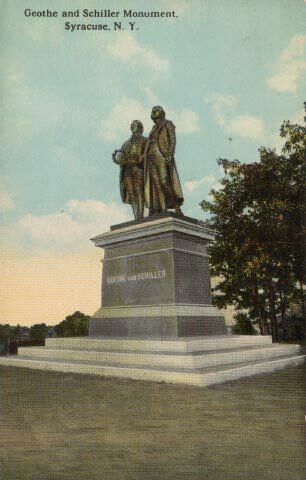 Caption reads: “Vanderbilt Square, Syracuse, N.Y.” Vanderbilt Square, along East Washington Street between Salina and Warren Streets, was named after Cornelius Vanderbilt, the railroad magnate and millionaire whose New York Central Railroad “dominated Washington Street for 100 years.” Everything in Vanderbilt Square became coated with soot from the locomotives running down tracks in the middle of the street. The red and white building on the corner, front right, is the White Memorial Building, built after 1895 (it is still standing and refurbished today). 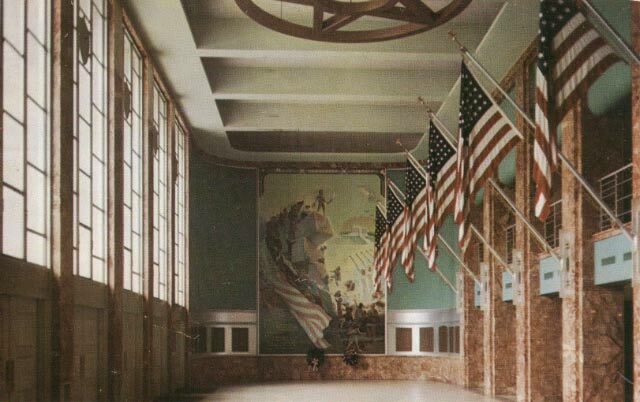 – Two-cent postcard postmarked February 1954, Ektachrome/Dextone E-67040 published by Marks & Fuller, Inc., Rochester, N.Y. Caption reads: “Memorial Hall Entrance, Onondaga County War Memorial, Syracuse, New York.” Built in (1951? 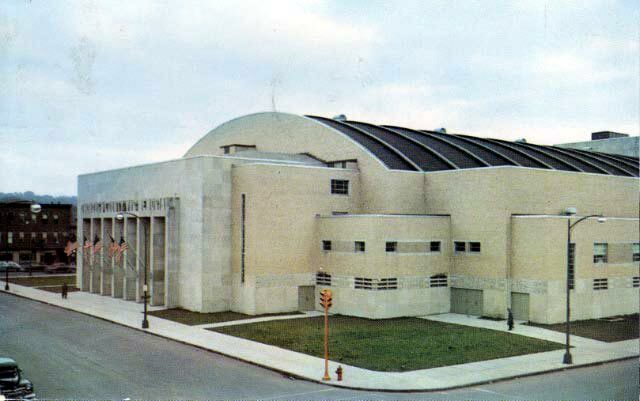 ), this hall is located on Montgomery Street near Madison and today is known as the War Memorial at OnCenter. It serves variously as a sports arena, concert hall, theater, and ice rink, with seating for up to 8,500 people (Jimmi Hendrix played there in 1969). – Image from a stereoscopic card, no date (c. 1900?). 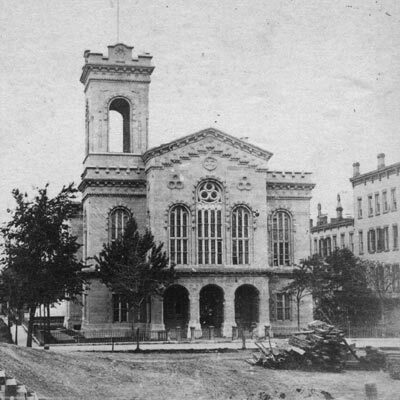 American Scenery, 1644, “Court House, Syracuse, N.Y.” This building was the “Old” (third) Onondaga County Courthouse on Clinton Square, Syracuse, New York, in use (for naturalizations and other legal processes) from 1857 to 1907. 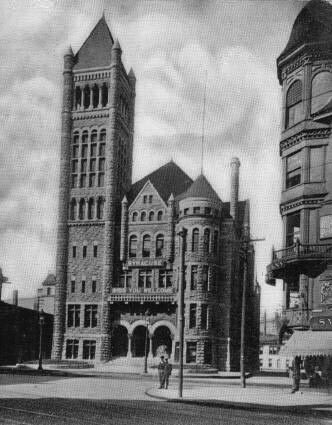 It was replaced by the current (fourth) courthouse on Columbus Circle. This building was torn down in 1967.